The Peking lilac is a dependable urban tree and a great choice even for parking lot, boulevard, and parkway plantings. Native to Asia, it is both hardy and beautiful, with attractive, amber-colored, peeling bark. 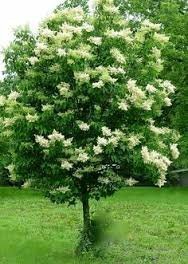 In early summer, when many shrubs and trees are done blooming, it has large, creamy-white, honey-scented flower clusters. Select One 1 Gallon Pot Bundle of 50 5"-9"